300 shares of SGR at $68.00. This is an infrastructure and post earnings suprise play. 300 shares of OII at $78.50. I’ve been waiting for this energy stocks to pullback near 20 day moving average support. 200 shares of BHP at $82.70. I bought this one at the 10 day moving average, which hs provided support for this high flying energy/metals/coal play since mid August. 300 shares of JASO at $49.10. It’s a high flying chinese solar stock. Need I say more? 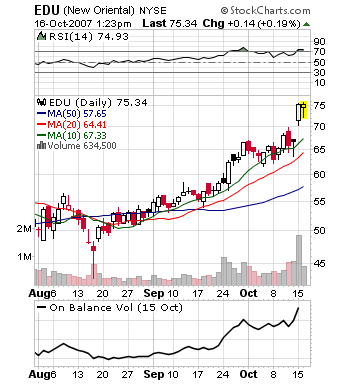 200 shares of EDU at $73.10. Education stocks have been on fire for quite some time (see also CPLA). The stock surprised on earnings yesterday and I bought today on pullback near the earnings breakout point. AAPL’s New High a Market Tell? How did you manage to get EDU today at 72.10? LOD was 72.21 if my data’s right. Sorry for the typo. I’ve fixed it. To The Market Speculator and other faithful readers:How many time frames with what averages do you find best for your style when at your trading station? I for example, look at 3 screens a 1, 90, 200 day. All 3 have a 20,50,200 Day SMA with one 50 EMA.